If you like cats and disco, this game will not disappoint. Cat Scratch Fever is full of funky disco-dancing cats with big hairdos and bell bottoms. This slot has a 97 percent RTP and is rated about average in volatility. There are 25 pay lines, five reels and three rows to give you many different winning options. When you want a break from playing Cat Scratch Fever, you may also enjoy Marilyn Red Carpet, which is a retro-themed slot paying homage to the late Marilyn Monroe. Also, 13 is a fun slot if you like cat themes. There are plenty of adventurous slots such as Book of Ra, Sparta, Anubix and others. The game has good graphic quality and attractive colour schemes. Street and window lights provide some contrast against the twilit city skyline in the background. The cats have expressive faces, and the main character is always on or around the reels as you play the game. 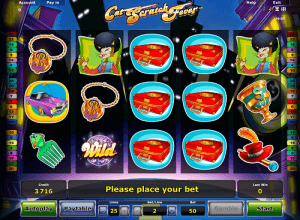 Cat Scratch Fever is compatible with most browsers and most operating systems and can als be played mobile. If you have the latest version of Flash, you should not encounter any issues with stalling. Betting is flexible in this game. You can choose between 10 and 25 pay lines to place a wager on. The minimum bet per line is .02 coins, and the maximum bet per line is four coins. This makes the minimum bet per round .20 coins and the maximum bet per round 100 coins. This special feature is unique to Cat Scratch Fever. When one symbol fills the first, second or third reel, the neighbouring reels appear to be scratched by cat claws. They are then filled with stacked random symbols. If any stacked symbols match the first stacked reel, you land a massive win. The win amount varies based on your bet level and the symbol. The bonus symbol in this game is labelled as such and is the equivalent of a scatter. You must spin nine of these symbols on one game screen to trigger the bonus game. You win between 18 and 30 free spins, and the special cat scratch feature comes into play during all bonus rounds as well. Novomatic's signature gamble feature is included with this slot. When you land a win on a pay line, you have the option to click collect or gamble. Collecting it adds it to your balance. Gambling it gives you a 50 percent chance of doubling the current win if you can guess the colour of a face-down card correctly. You can gamble for several rounds to give you the chance to quadruple your win or raise it even more. For example, imagine that you win 20 coins from the regular game. If you choose to gamble it and win, you earn 40 coins to collect or gamble. If you gamble again and win, the 40 coins is doubled to 80 coins. This continues until you lose the current win, collect or max out the gambling rounds. To spin the reels automatically until you reach a win, click the autoplay feature. The autoplay feature is simple and does not allow you to pick a number of rounds or a loss maximum. Click stop to exit auto mode. You can adjust the casino sounds by clicking the speaker icon, and you can turn off the background music by clicking the music note icon. To play in full-screen mode, click the expansion tab at the top of the screen. Click the arrow tab next to it if you want to double the spinning speed of the reels. Click the paytable button to view the character values, win lines and bonus information. This game gives you free demo credits to use, which cannot be cashed in. You can play in demo mode until you are comfortable wagering real money. If you want to try some other slots first, you may enjoy Plenty on Twenty, Amazing Stars and Wonder World. Novomatic Casino also offers electronic table game favourites such as roulette, blackjack and poker through online host casinos.